Interested in becoming a licensed skydiver? This is the certificate for you! 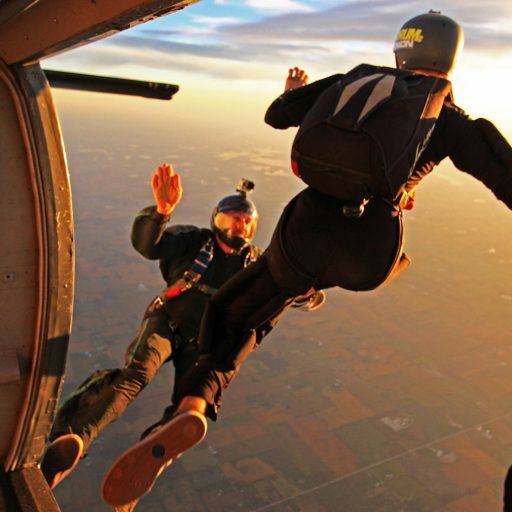 Purchase your ATP Ground School and 1st Tandem Progression Jump & save $10! Includes a 4-6 hour ground school. Instruction provided is based on the USPA AFF/ATP Programs. At the end of your course you will get to go your 1st Tandem Progression jump and put what you learned in groundschool to the test! Monitor your altitude, deploy the parachute, fly your canopy to landing under the guidance of an instructor. After 2 Tandem Progression jumps have been completed, and your aptitude for the information taught has been demonstrated, you will be cleared for your 1st “Solo” skydive. All instruction, rental equipment, parachute repacking, training materials are included. Must be 18 or older with valid ID and weigh less than 230lbs. No refunds. No Expiration.